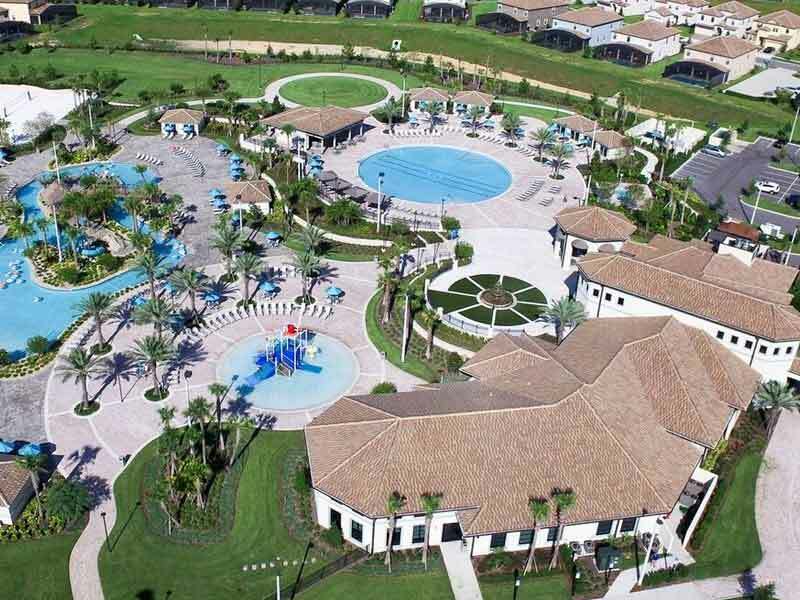 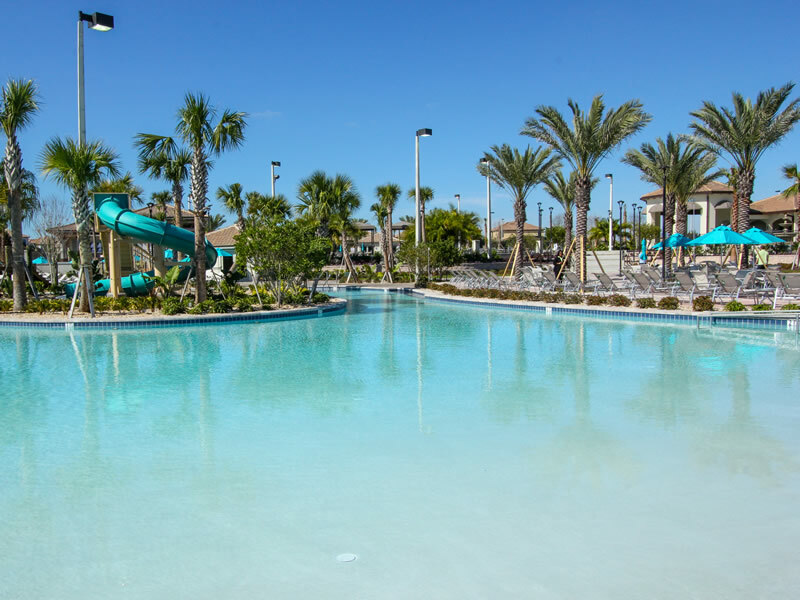 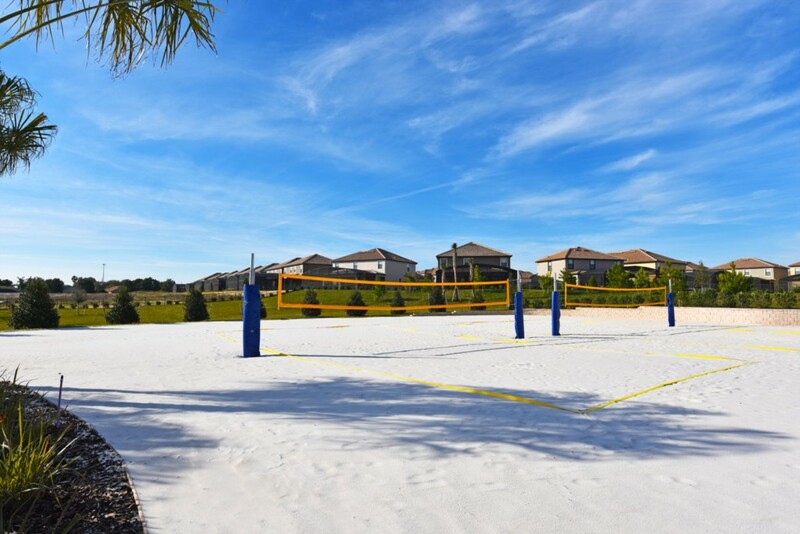 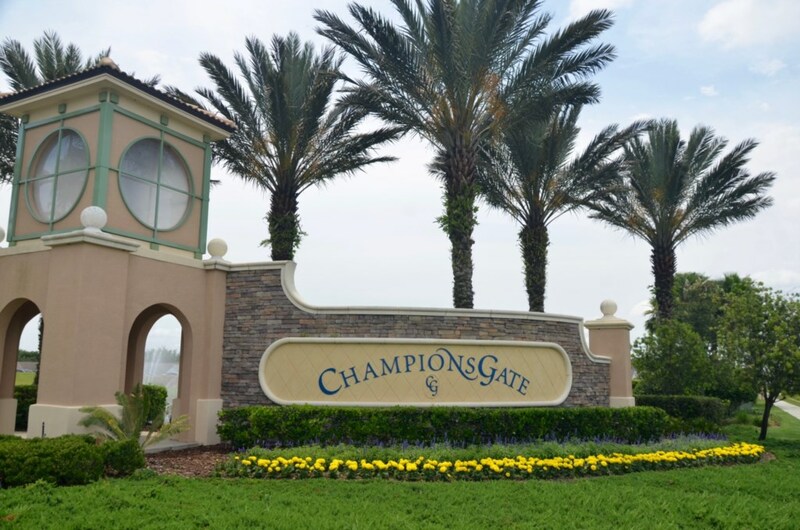 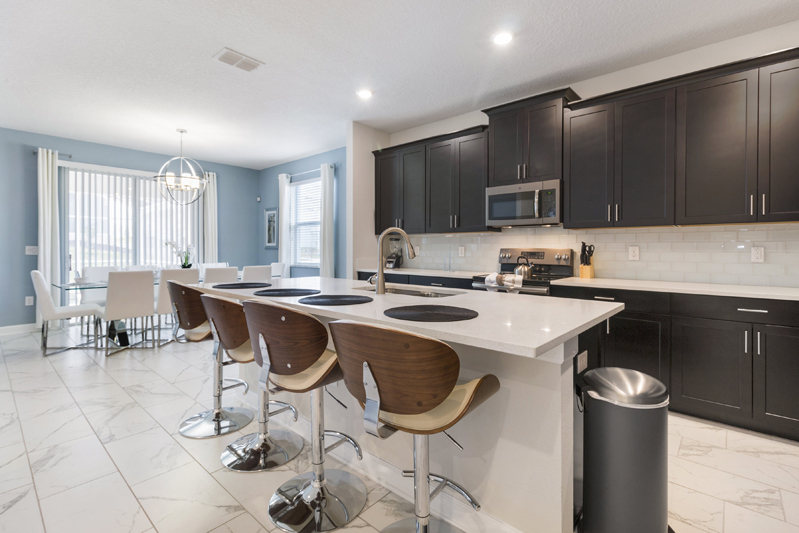 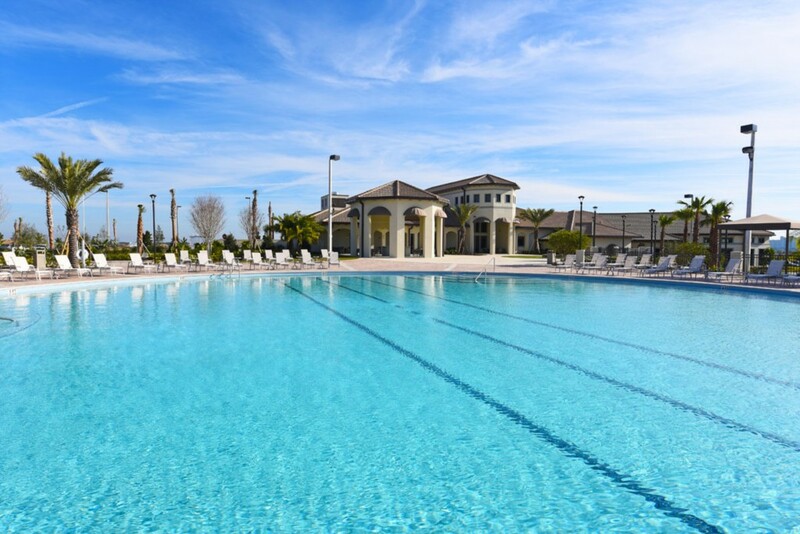 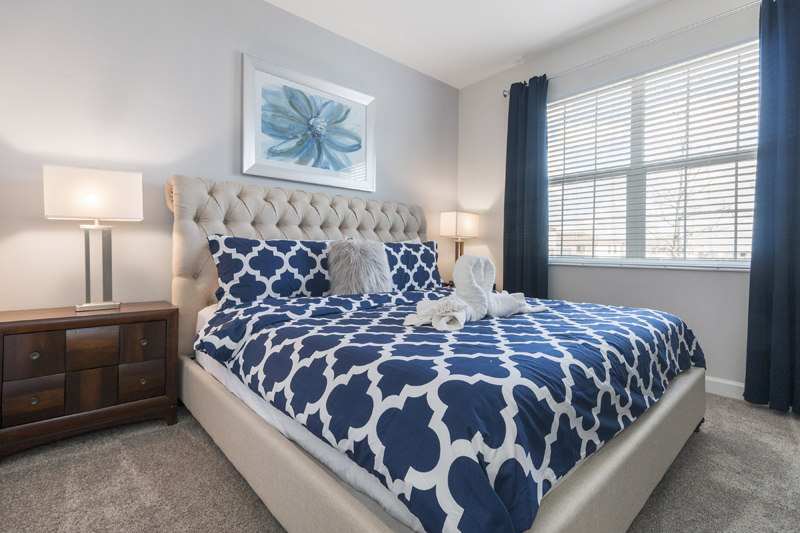 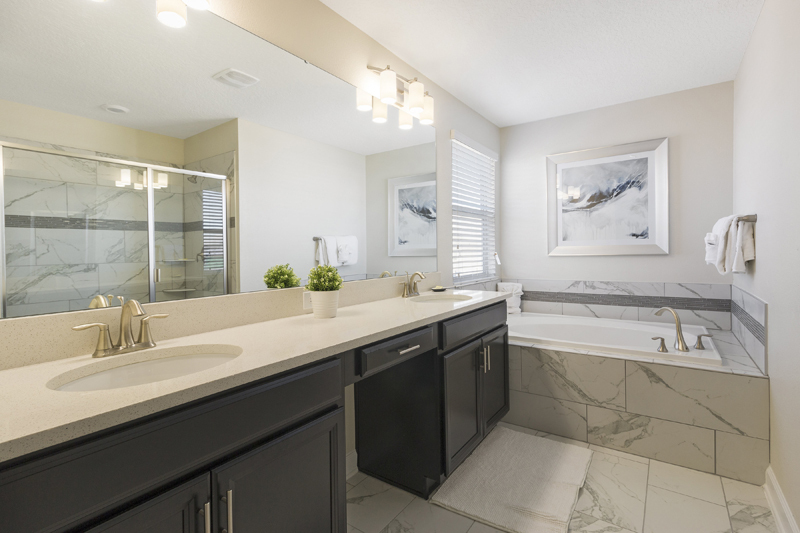 Champions Gate Resort is perfectly located with easy access to all of the Orlando attractions including the World Class Theme Parks, Outlet Shopping Malls and Championship Golf Resorts. 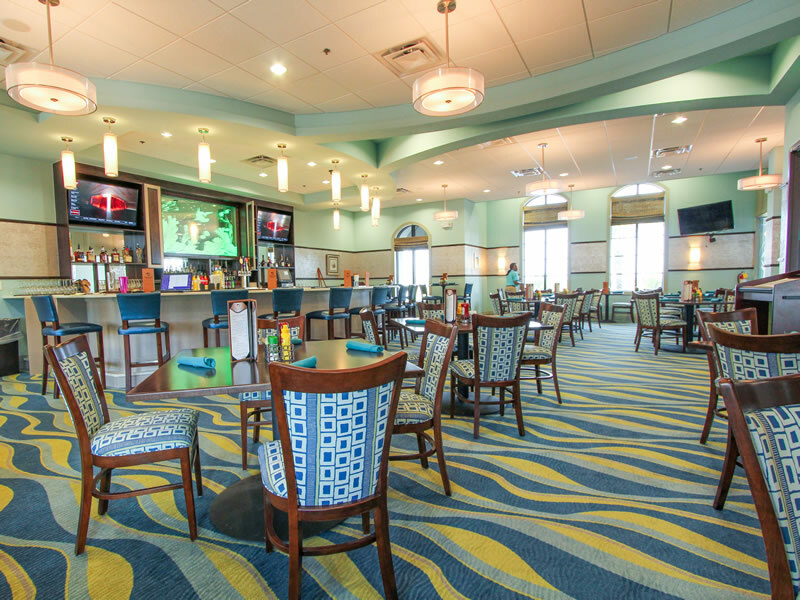 There is a vast range of Excellent Restaurants nearby with everything from American Style Bar and Grills to Roof Top Fine Dining at 5 Star Hotels. 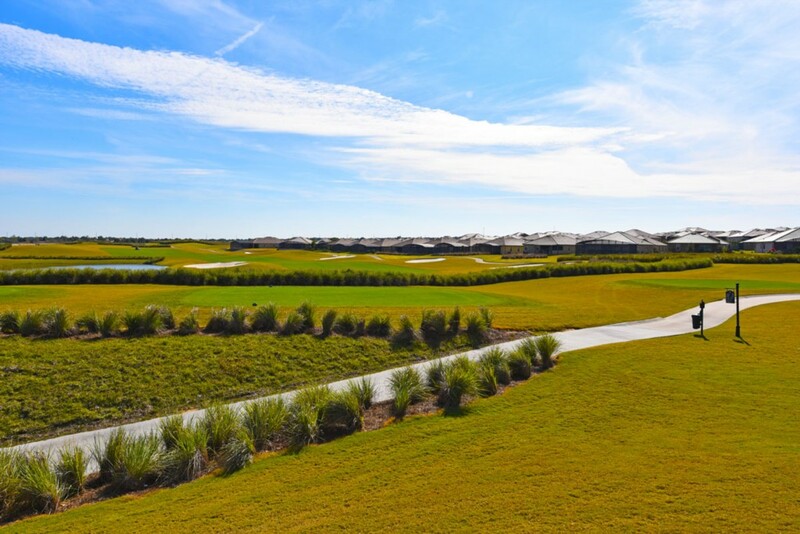 The onsite 18-hole Golf course designed by famed architect and golf pro Greg Norman is complimented by another 2 other golf courses within Champions Gate and you are only minutes to several world-class golf resorts meaning you can golf for a week and play a different course every day. 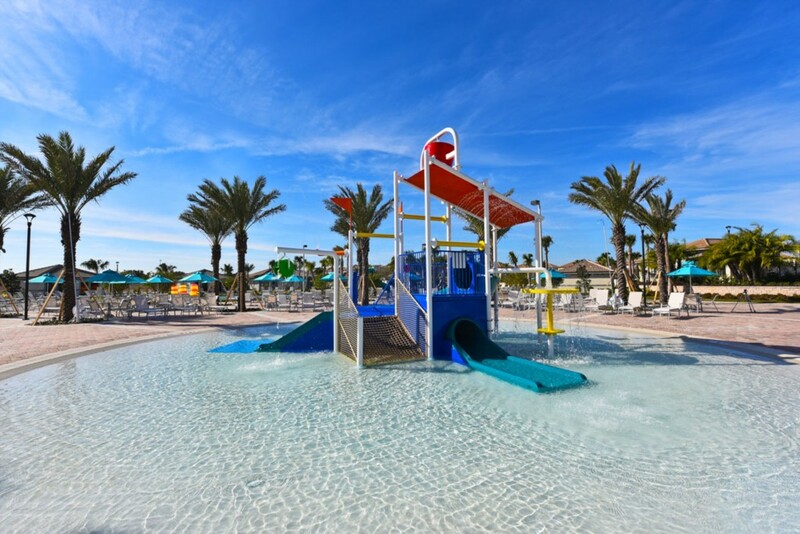 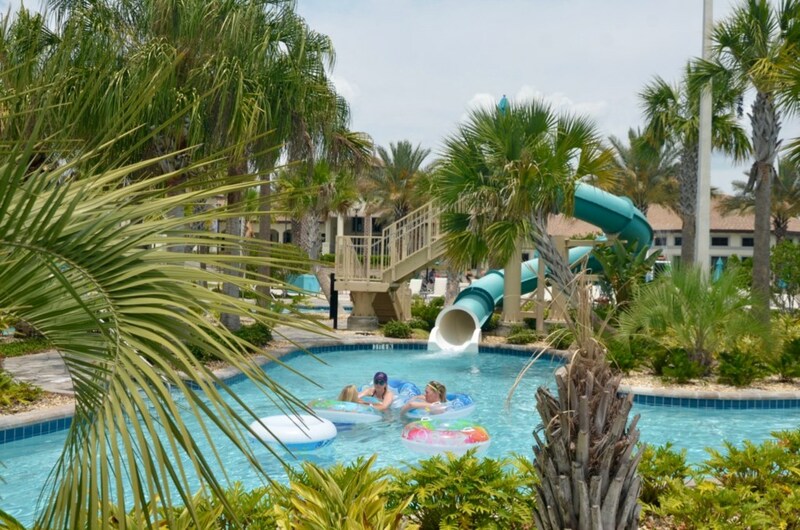 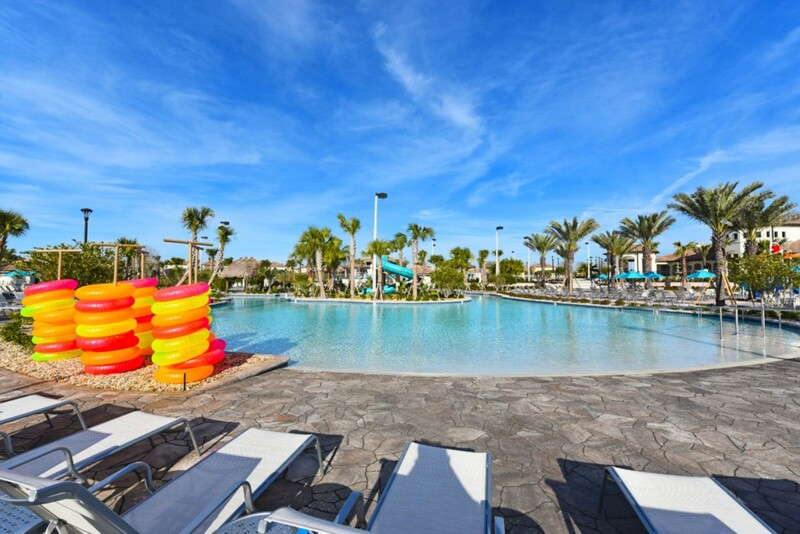 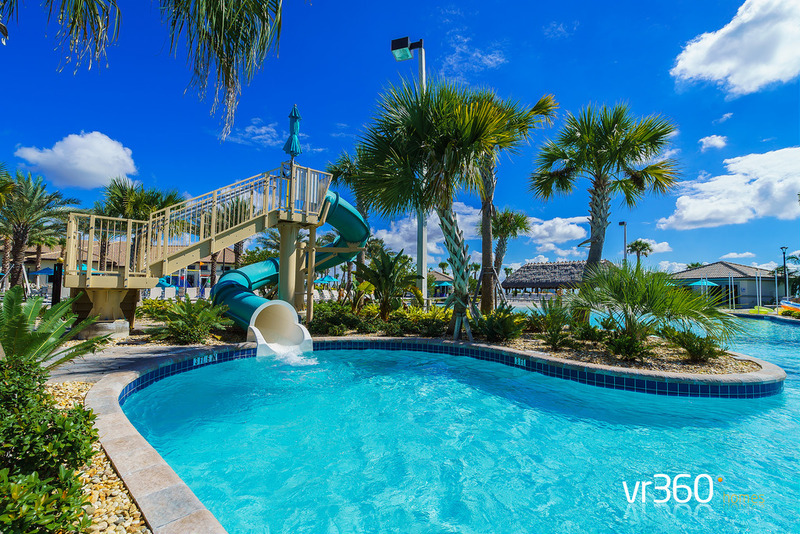 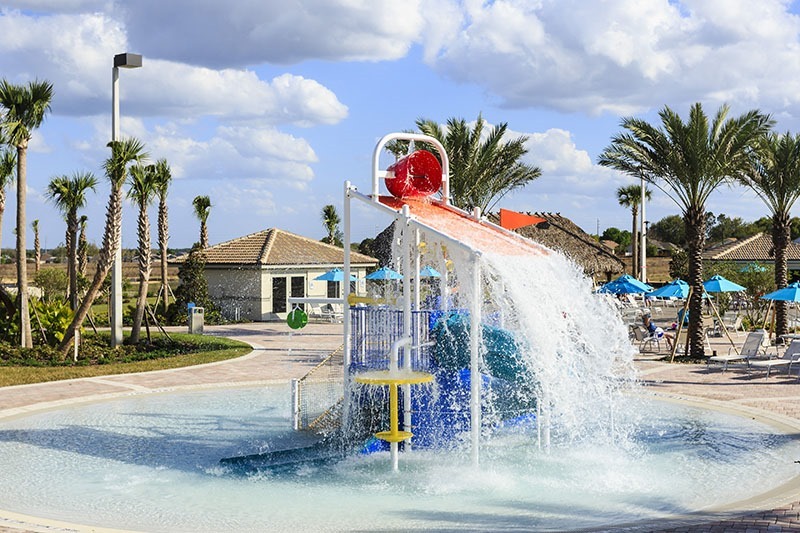 The Oasis Clubhouse features two huge resort style pools that includes a fun pool with waterslide and a splash park plus a lazy river offering boundless entertainment. 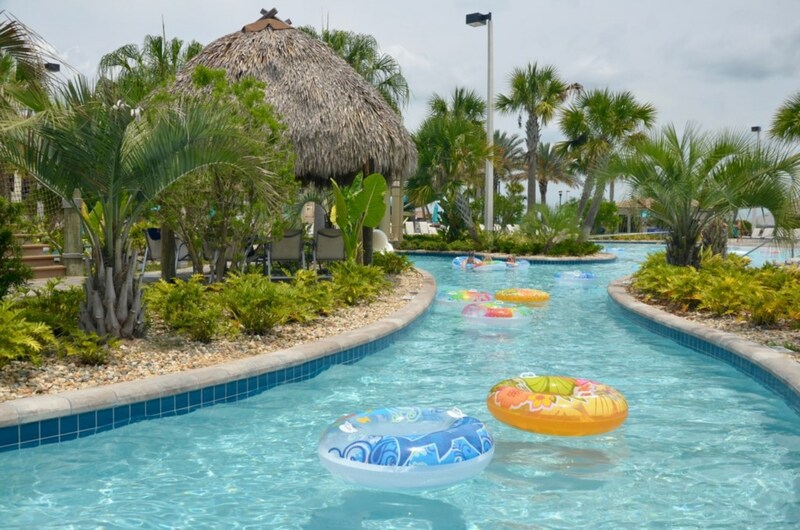 The addition of an adult pool where you can relax in one of the fully serviced Pool Side Cabanas will make your stay the ultimate in indulgence, luxury and glamour. 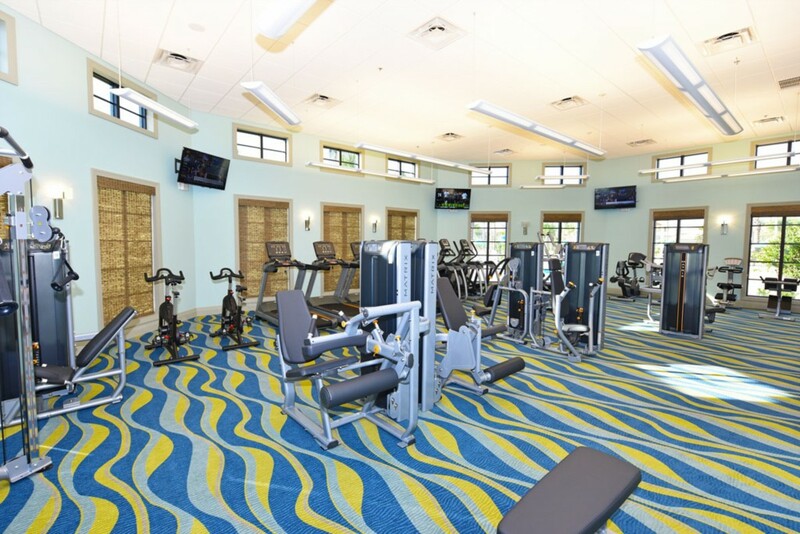 The club house has a restaurant and a full-service bar available and the fitness wing has all the latest in cardio and weight training equipment with a spa to relax and help rejuvenate your tired muscles. 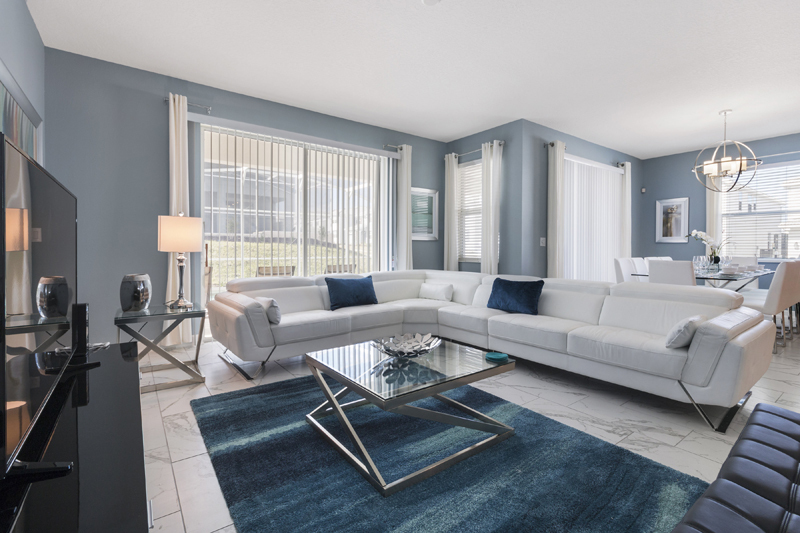 Our magnificent two storey home is the epitome of Elegance, with an up to the minute modern style that is pure sophistication and luxury. 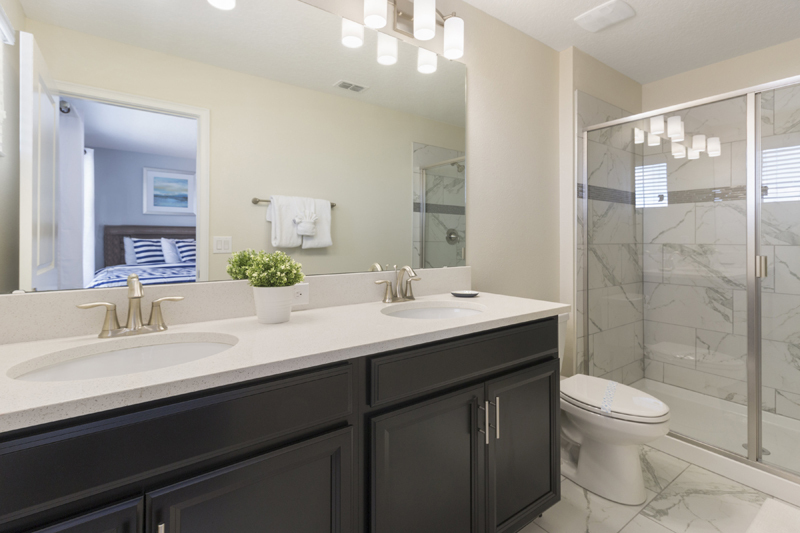 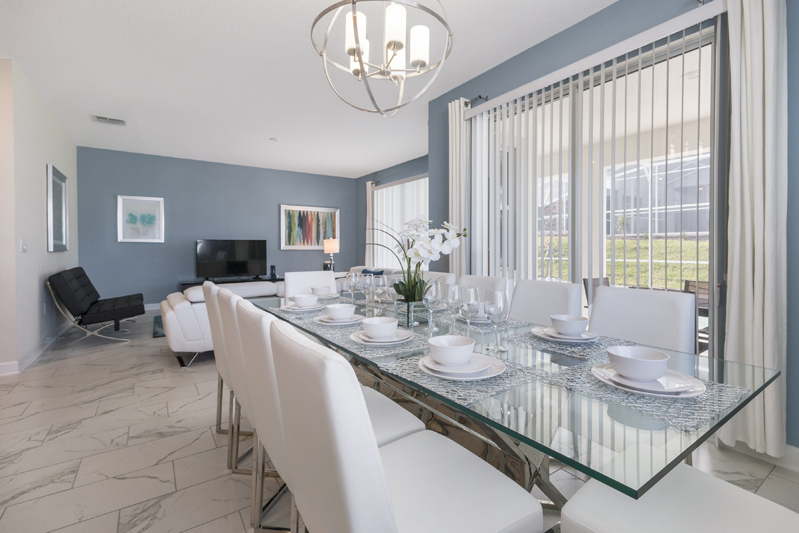 There is a cool serene colour scheme that brings a calming atmosphere through the entire home, complementing the wonderful Florida climate. 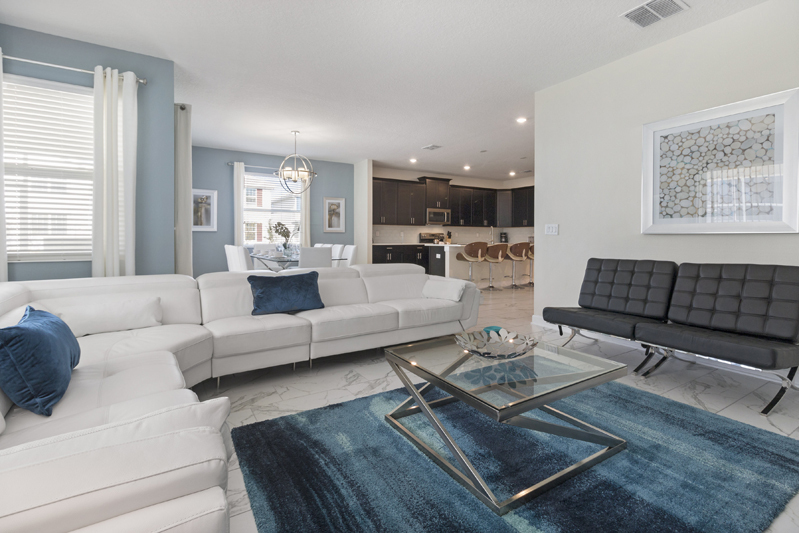 This is a truly stunning home offering Luxury and comfort for your enjoyment, with several iconic furniture items placed throughout the home. 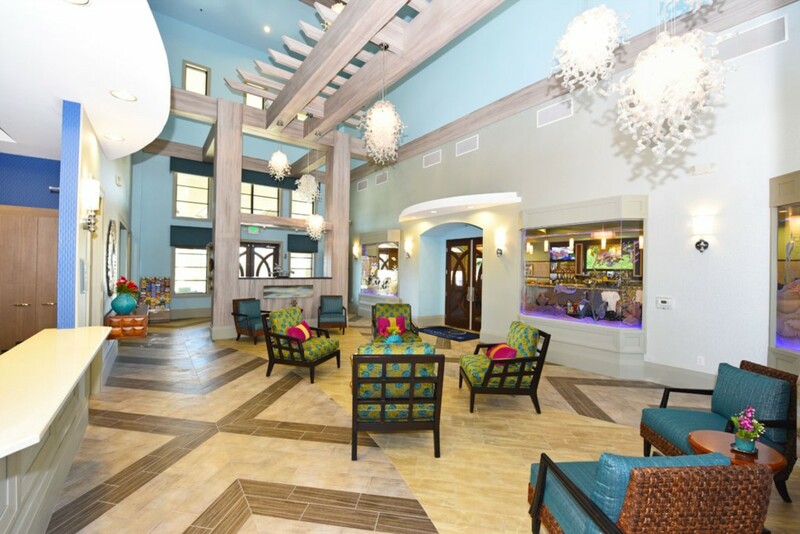 This attention to detail cannot fail to impress the more discerning guests. 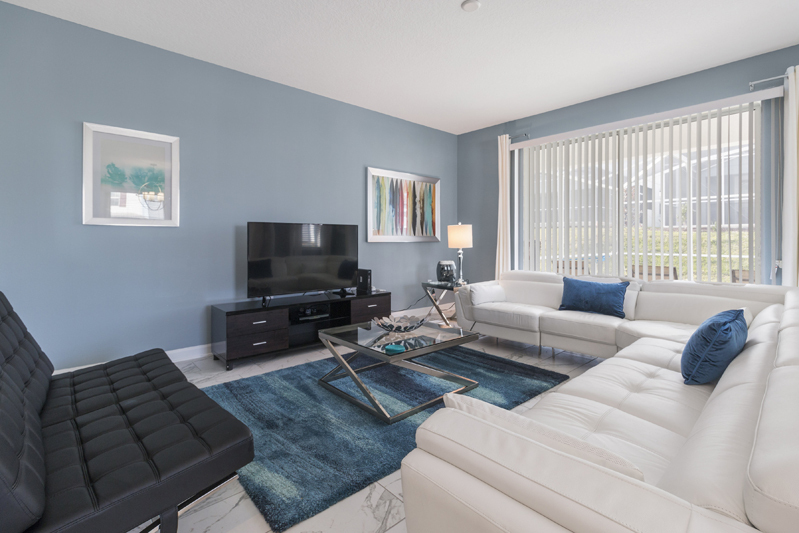 The Living Area is beautiful and is positioned to the rear of the home with views to the pool area, which is a real bonus for those travelling with children as you can keep watch over them from the lounge. 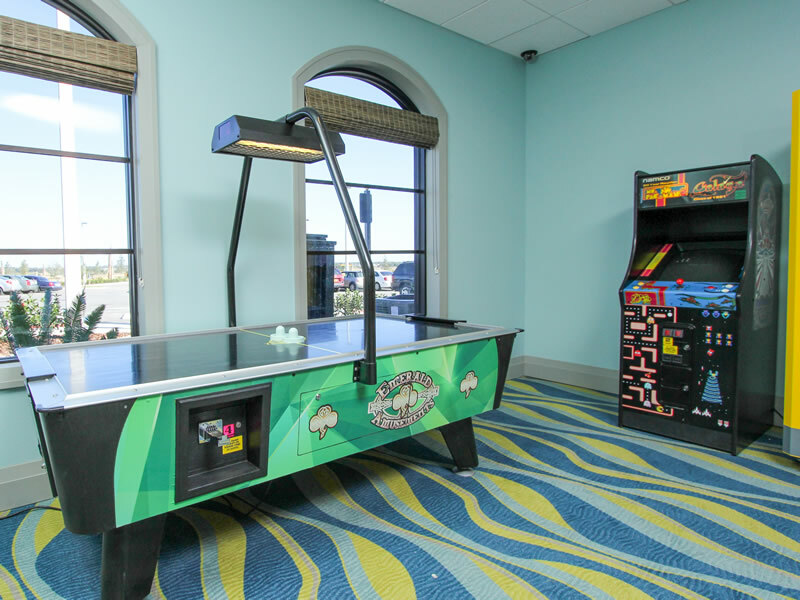 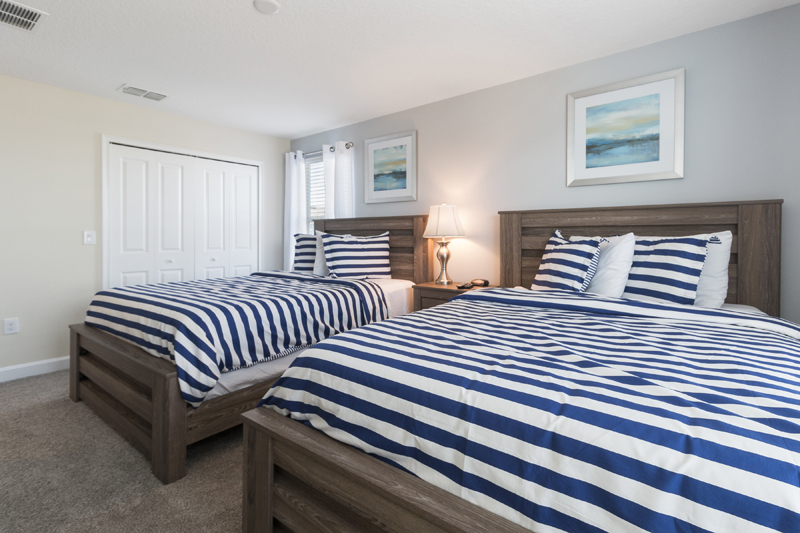 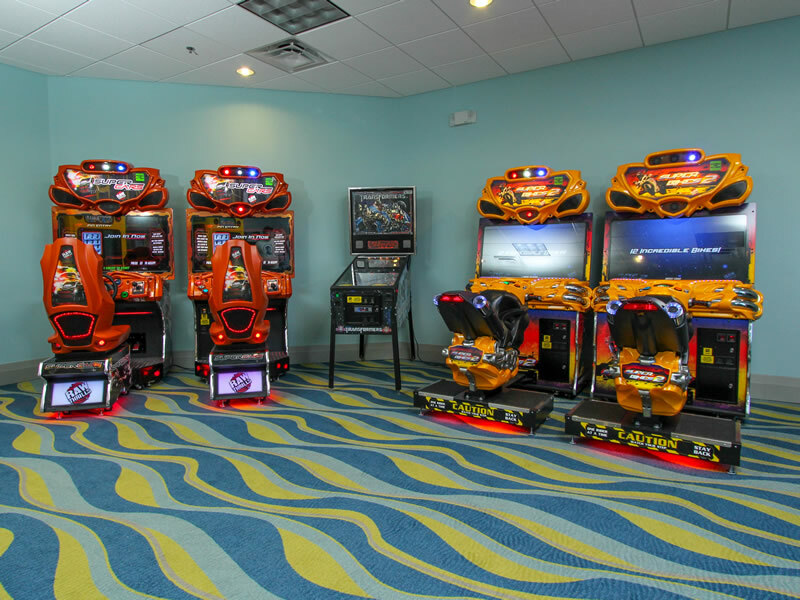 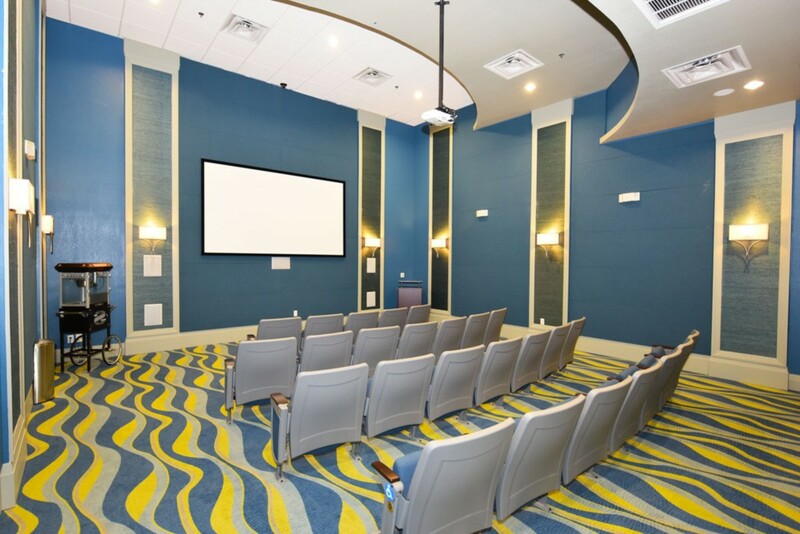 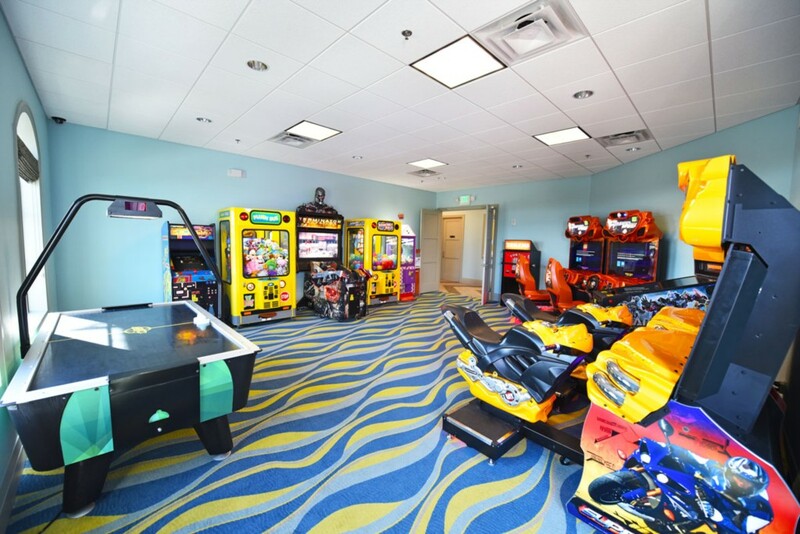 There is plenty of comfortable luxury seating and a Large Flat Screen Television, which you will find will be the place everyone will gather in the evening to unwind and enjoy a movie or a ball game at the end of a busy day visiting many of the attractions that Florida has to offer. 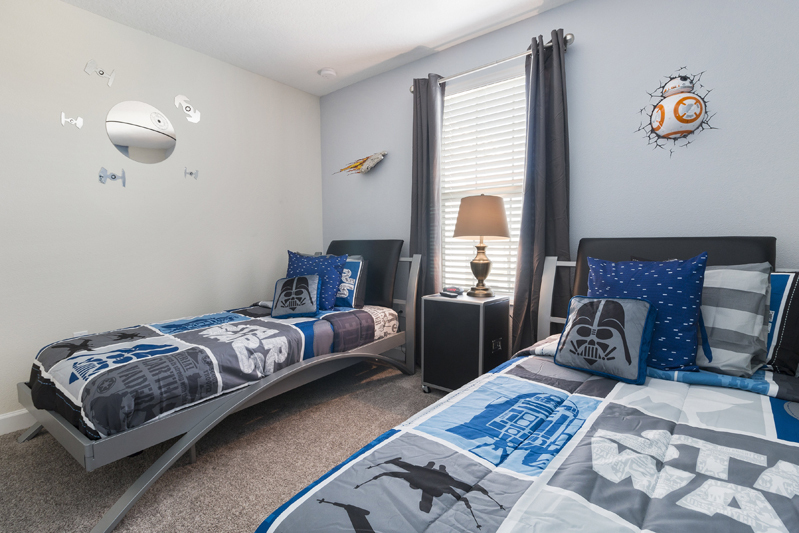 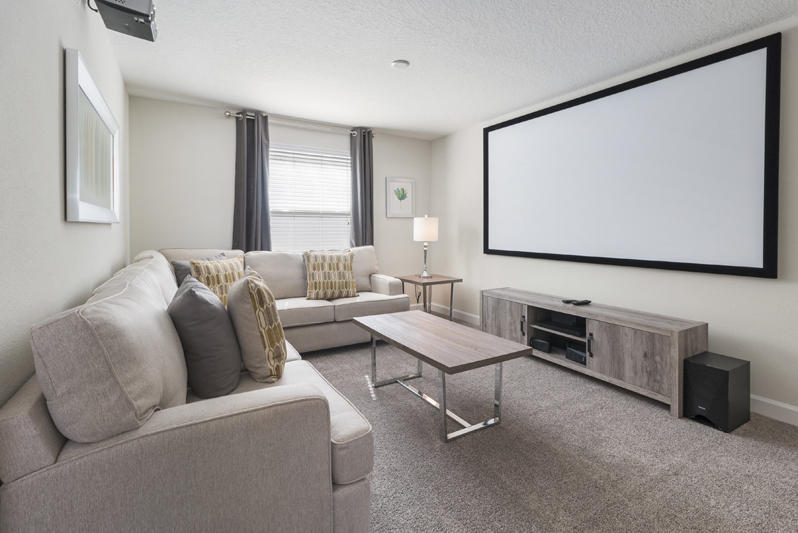 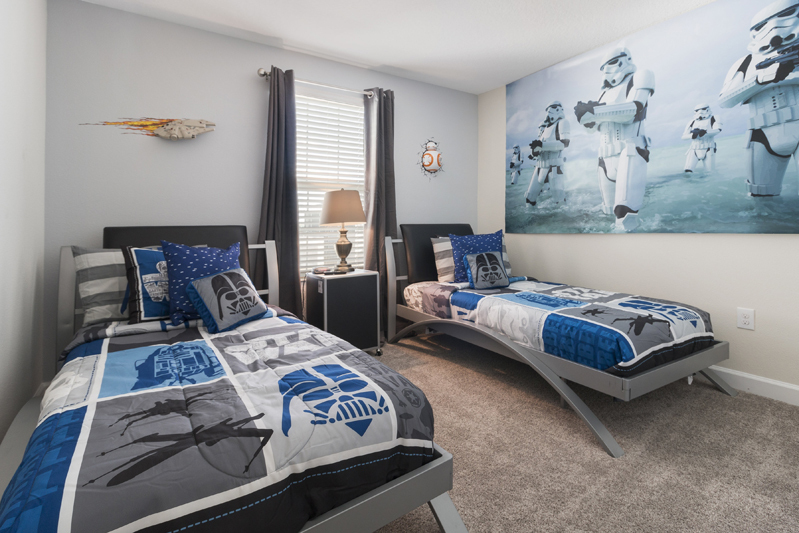 Family Room – there is a further family area upstairs that includes a very large screen with DVD player, this will be popular when you find a game clashes with a great movie, or just to keep the children happy in the evenings. 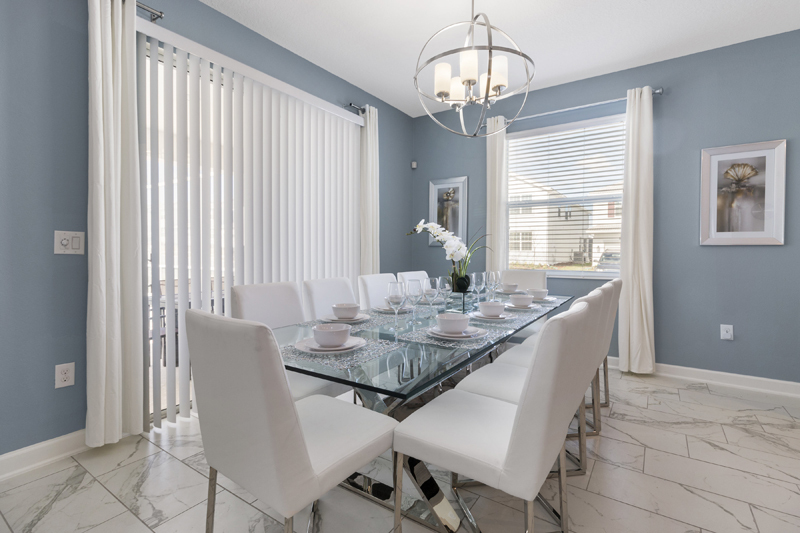 The Dining Area is stunning with an elegant flair that is so evident in the home, with the striking dining suite that will accommodate your guests. 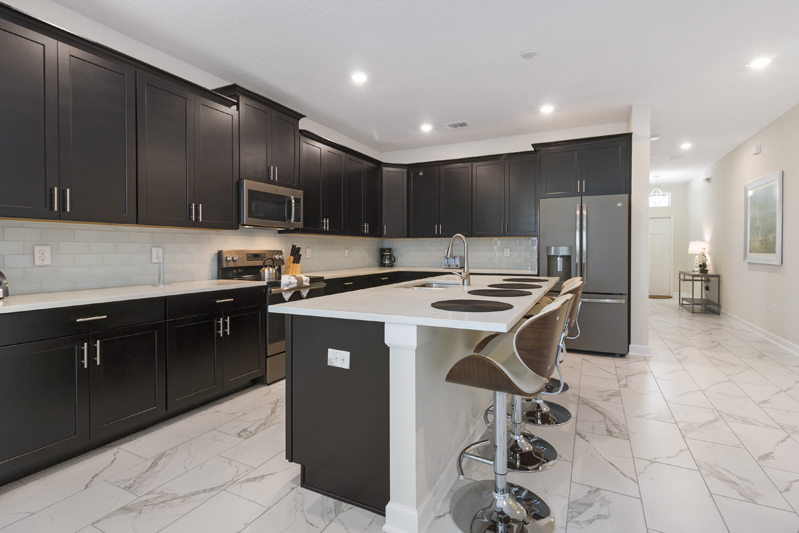 This is a great place for the family to gather in the evenings and chat, perhaps plan more trips while enjoying some home cooking. 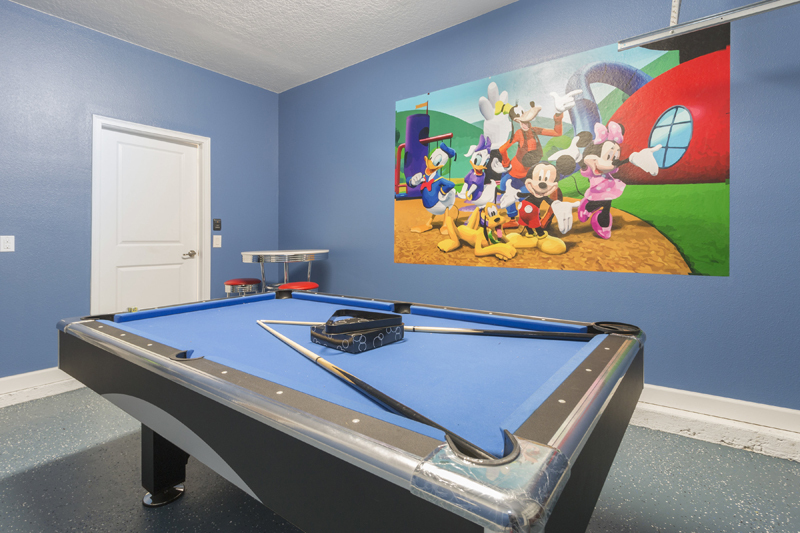 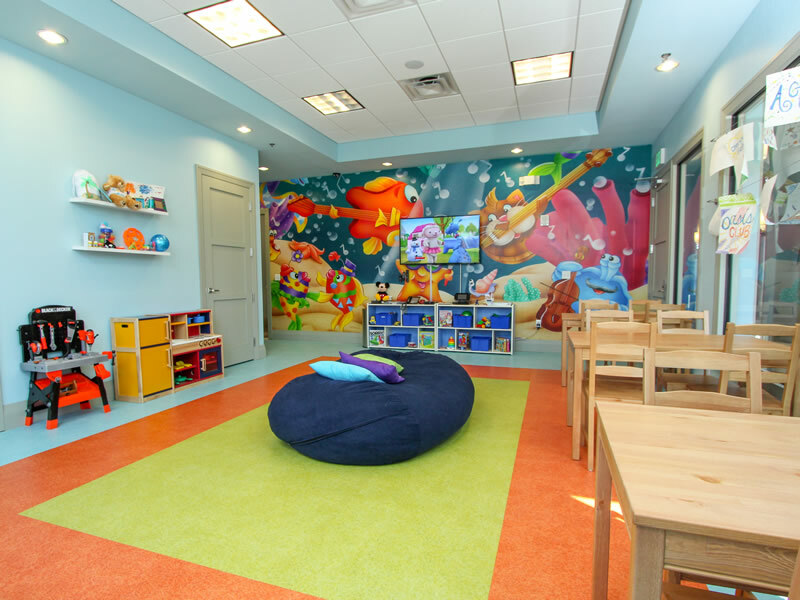 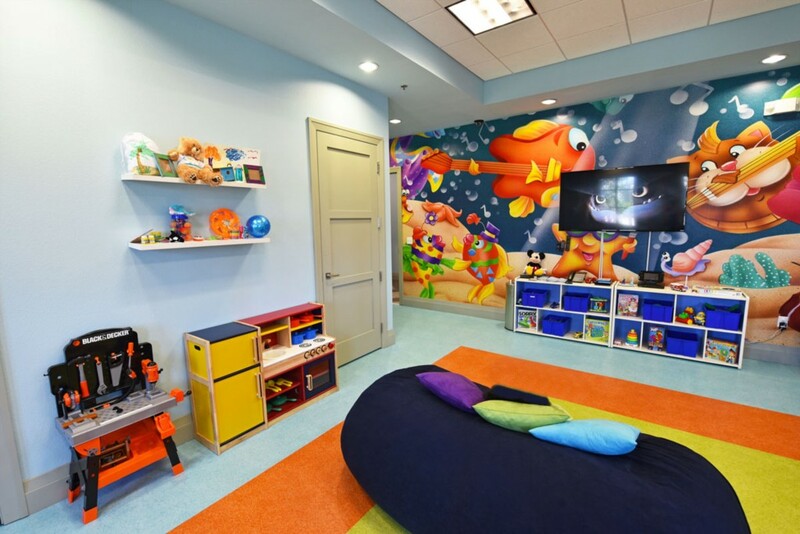 Games Room is a great addition to any home as it offers some light relief for the more competitive of the group. 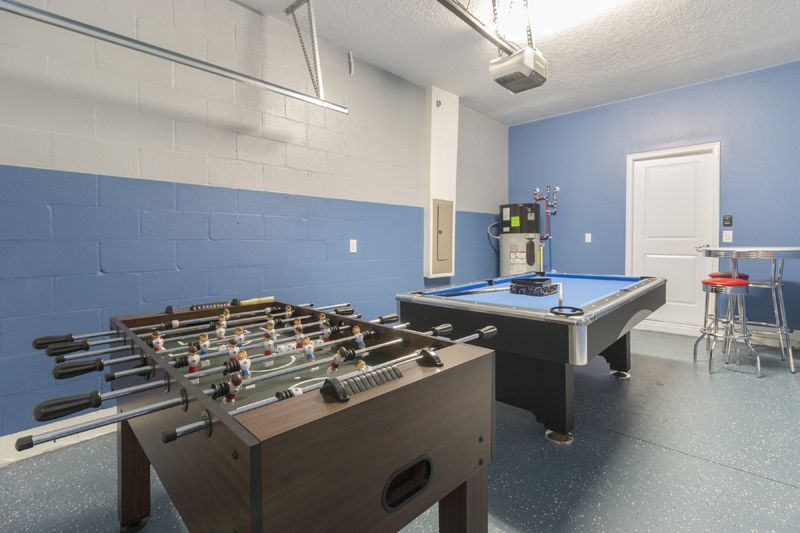 There is a Pool Table, Foosball and a seating area for those who want to cheer on the competitors or watch the wall mounted Television. 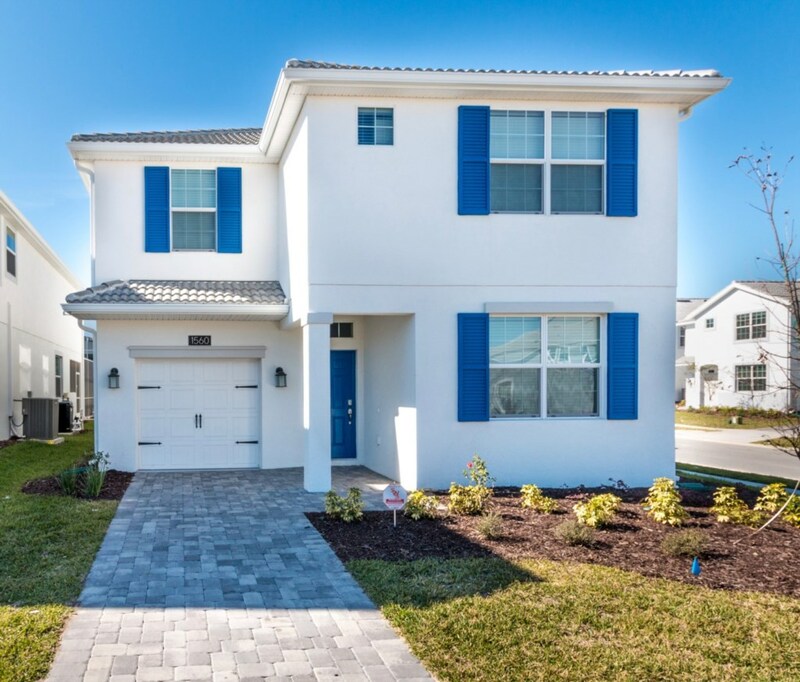 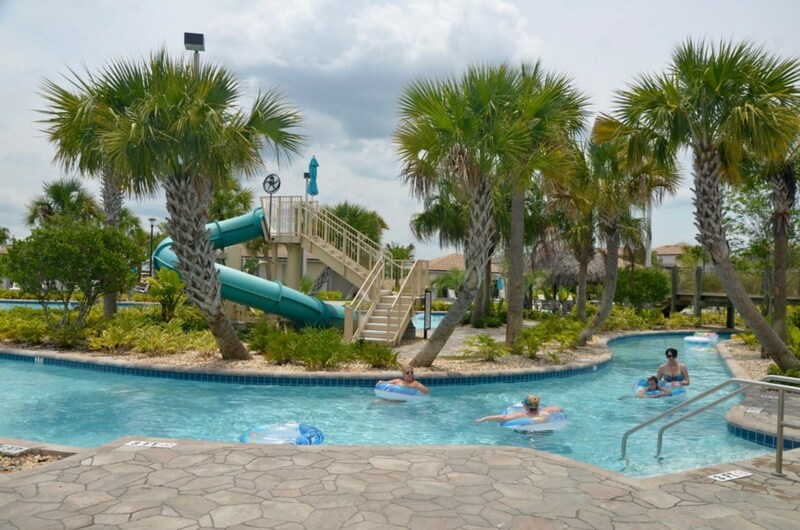 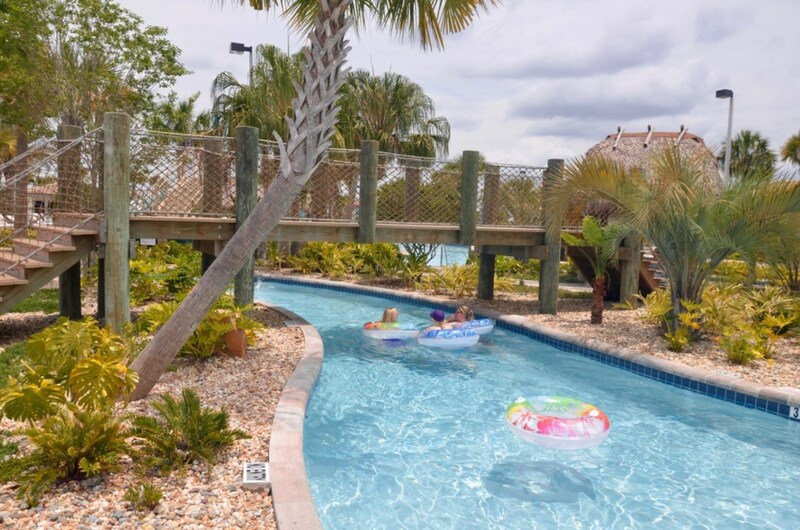 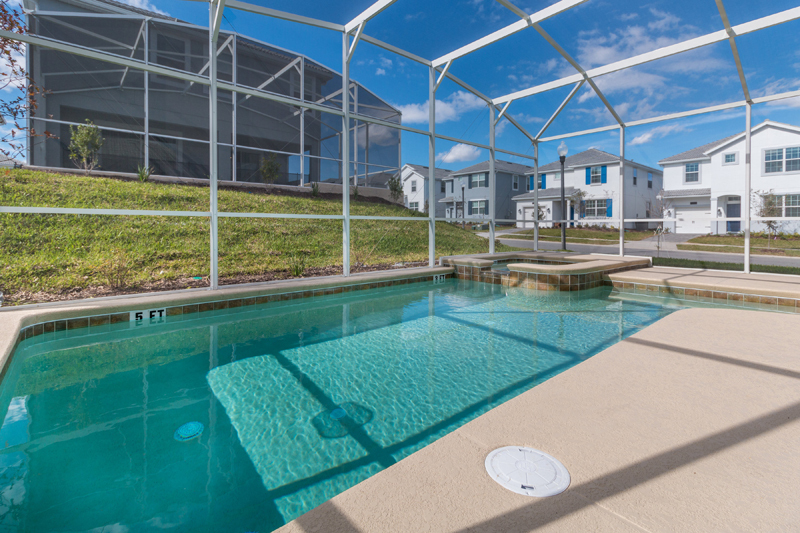 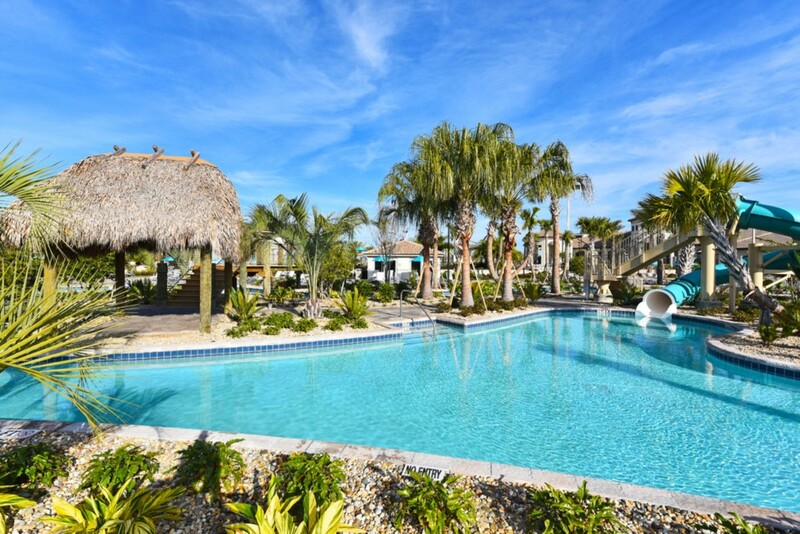 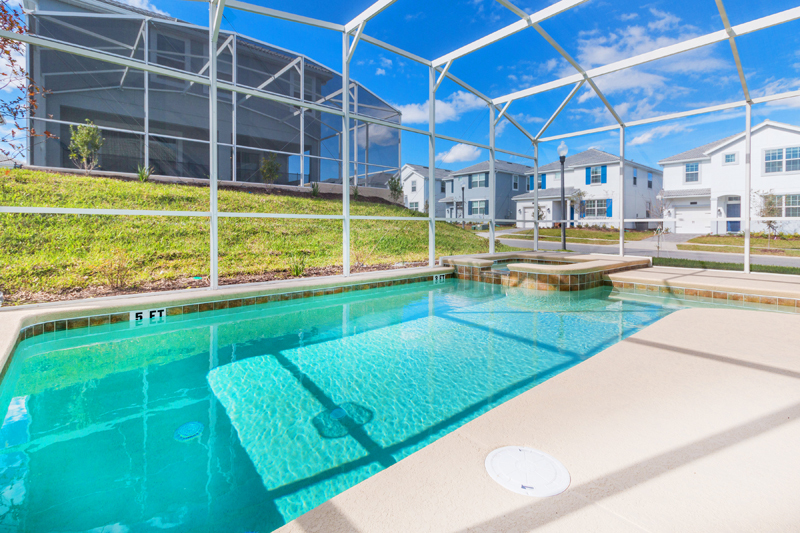 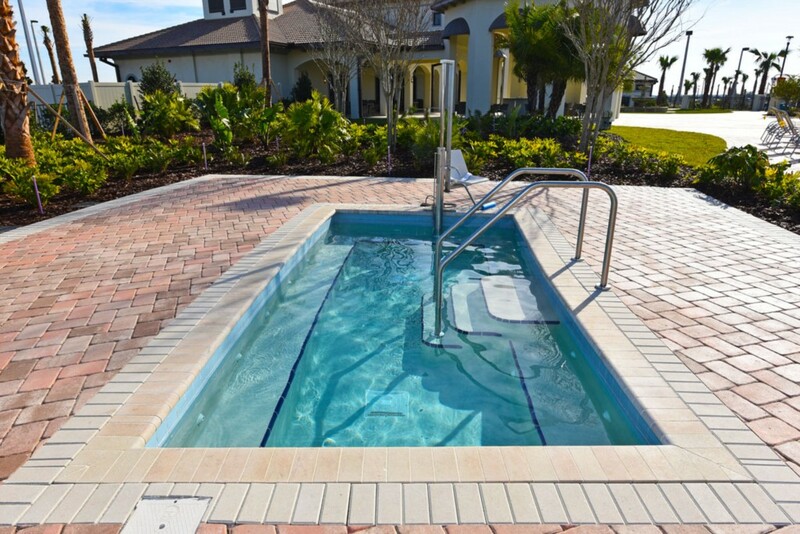 The Outside has a beautiful pool deck, and the pool includes a spa and with the addition of sun loungers, you can enjoy the Florida sunshine and relax with a book while the children play in the pool. 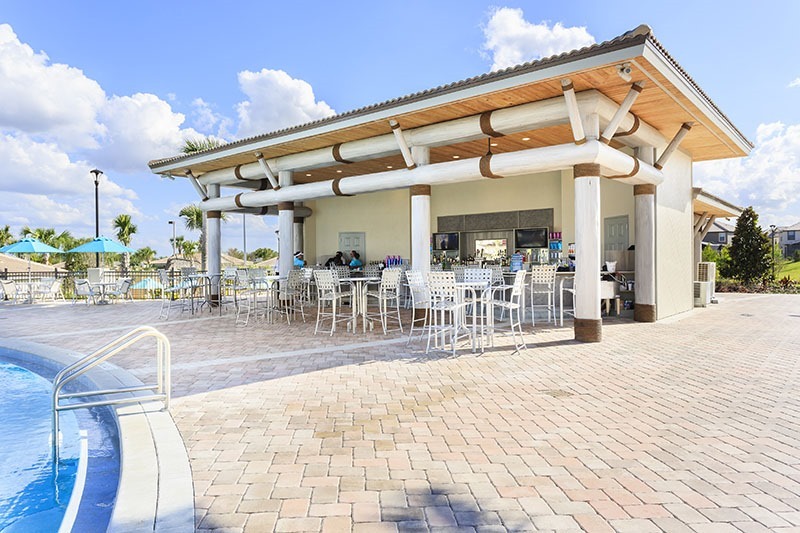 There is a covered lanai with table and chairs where you can sample the delights of outdoor dining, be that a quick breakfast or some nibbles and a refreshing drink at the end of the day. 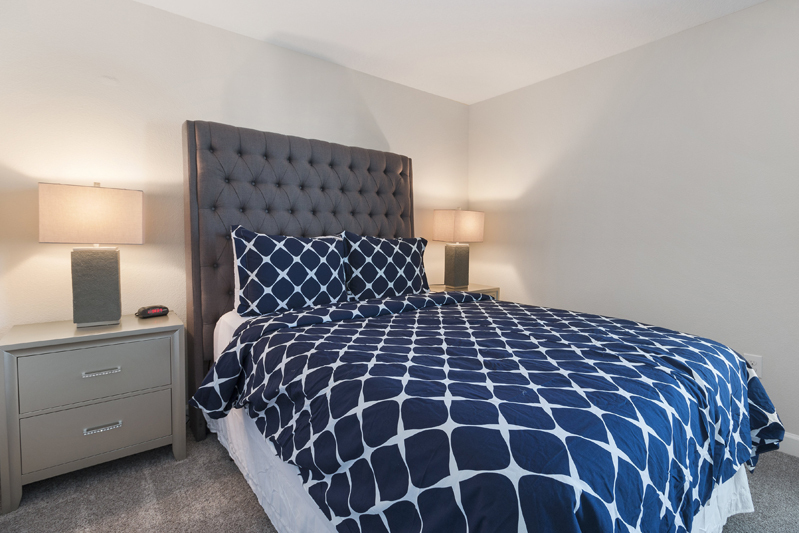 Bedroom 1– (downstairs) Twin room which has two single beds that include Ensuite Facilites.. 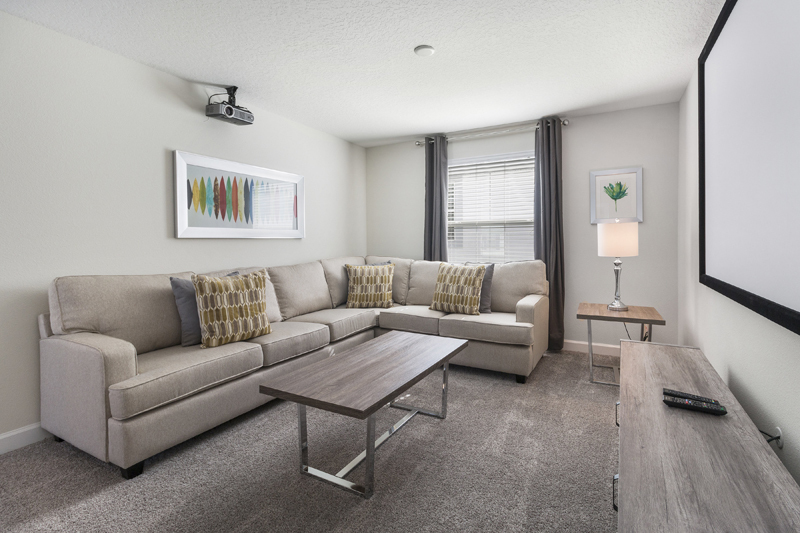 There is also a flat screen TV, perfect for any guest who may have problems with access to stairs. 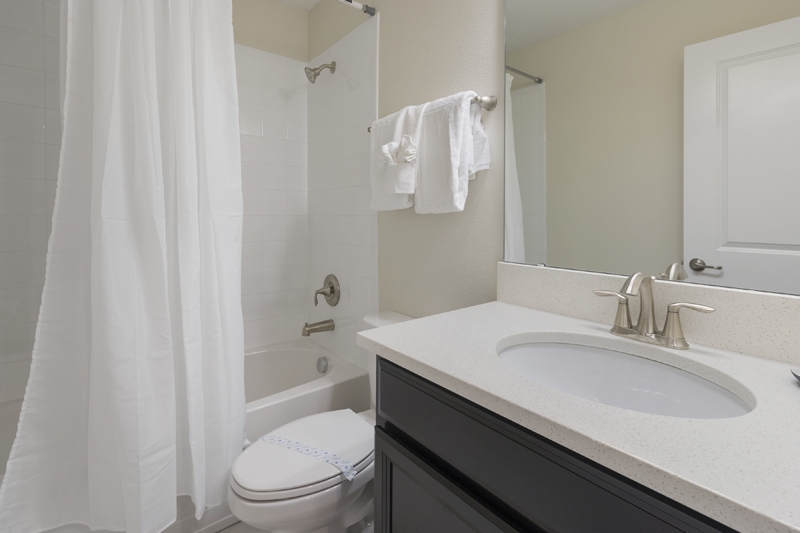 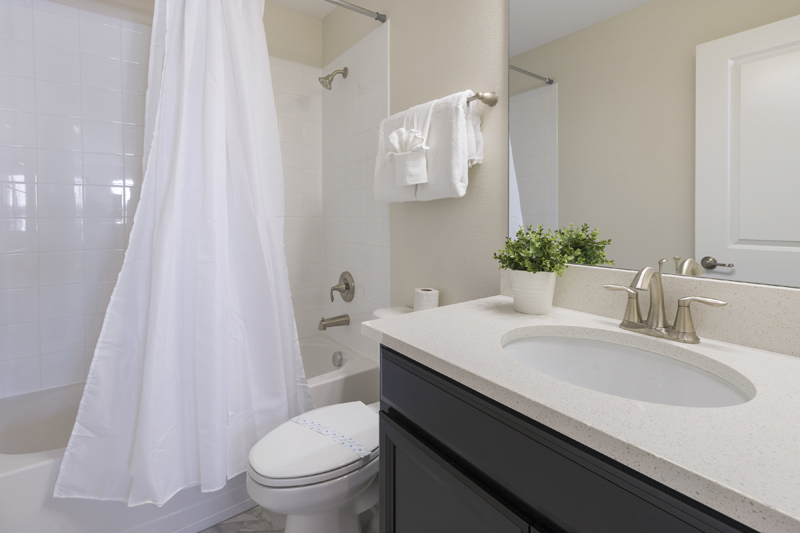 Bedroom 2 – (upstairs) King Suite with en-suite facilities of a bath and separate shower and twin basin unit. 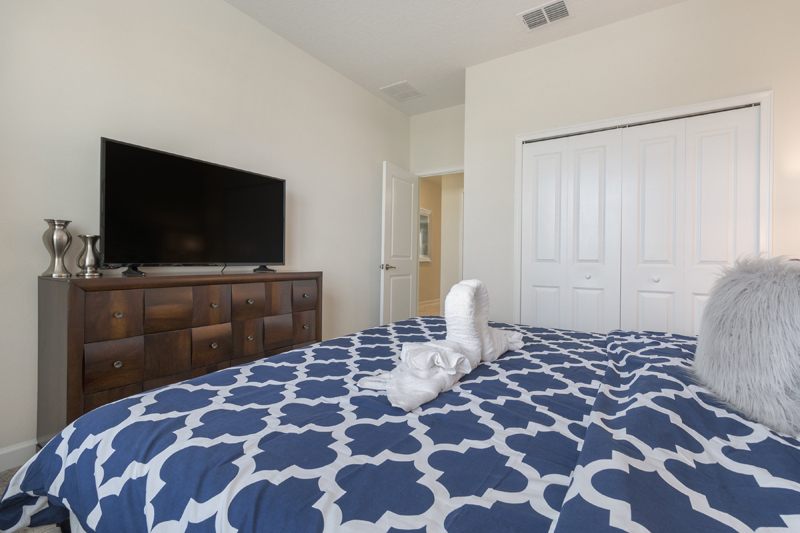 There is a King bed and a Flat Screen TV in this sumptuous and elegant room. 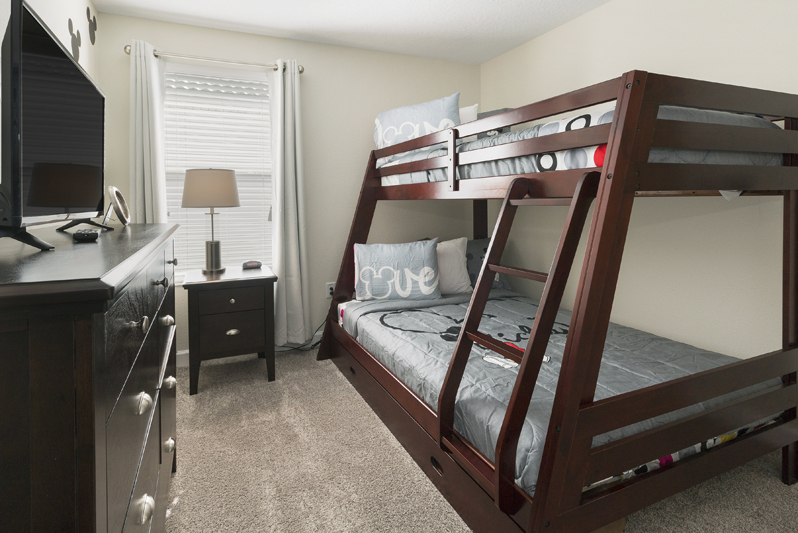 Bedroom 3 – (upstairs) Twin room which has bunk beds that include a full bed on the bottom, plus Ensuite Facilites.. 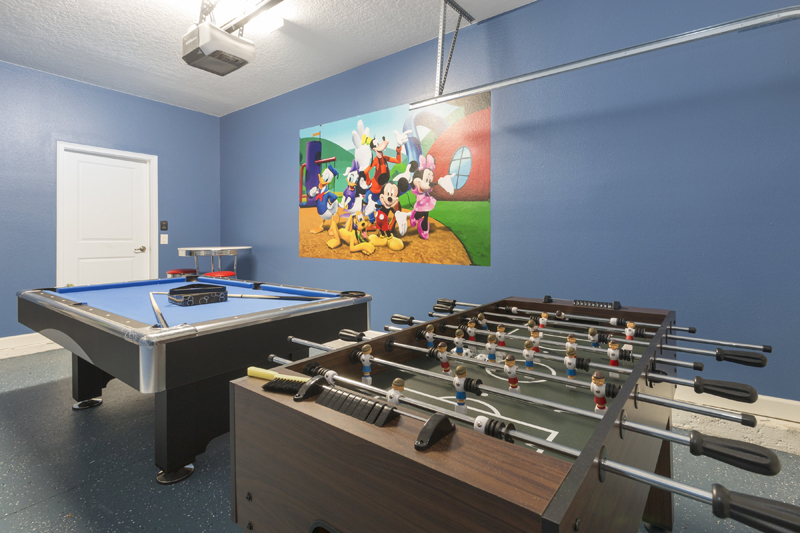 There is also a flat screen TV, perfect for siblings with friends or cousins sharing the fun. 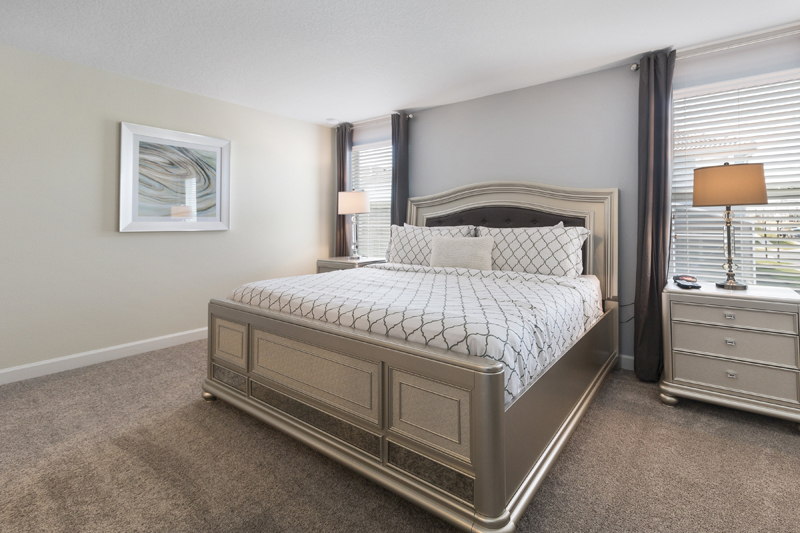 Bedroom 4 – (upstairs) Queen Bedroom with a bathroom situated next door. 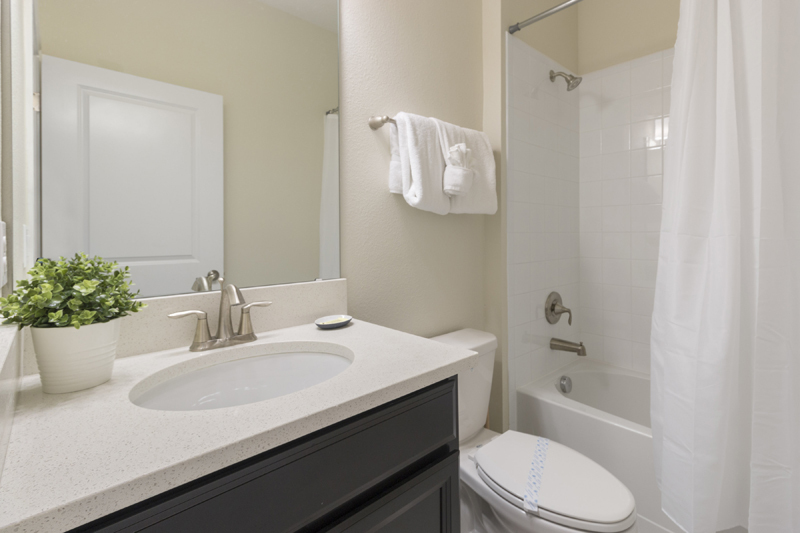 This is a beautiful stylish room and includes a flat screen TV with a bathroom in the hall. 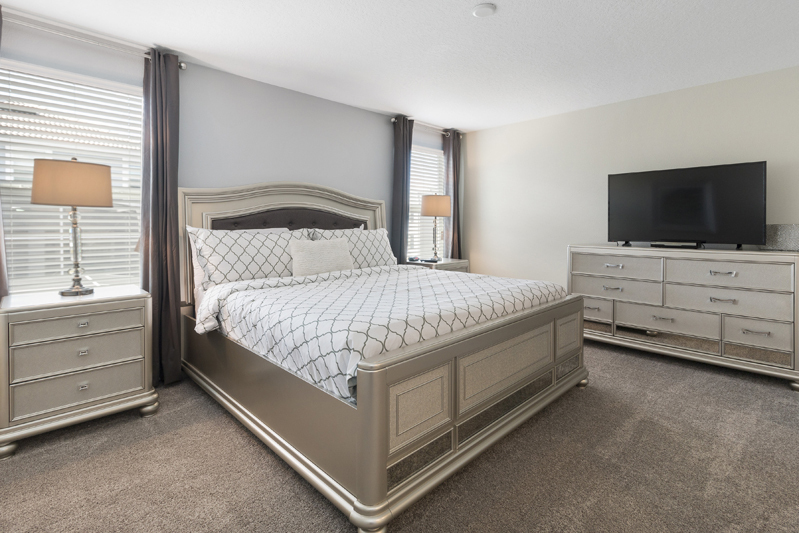 Bedroom 5 (upstairs) Queen Bedroom that includes two Queen Beds, with a flat screen TV, stylish décor and a bathroom in the hall for your use. 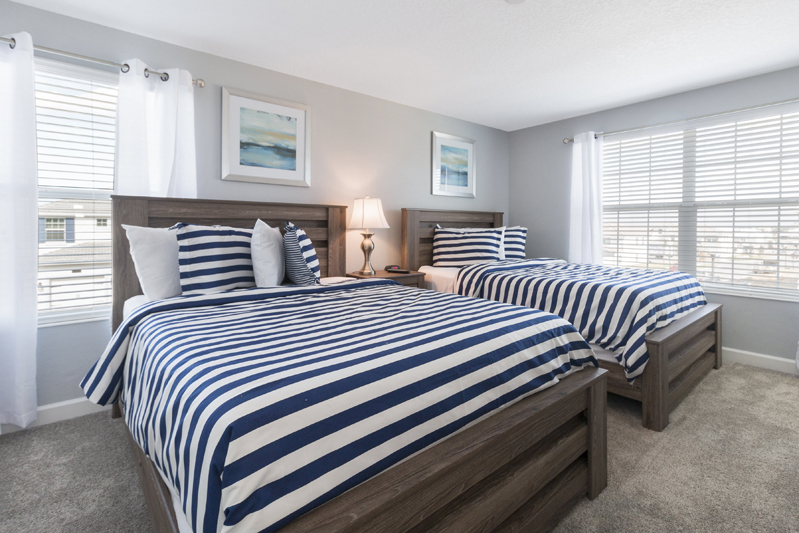 Bedroom 6 – King Suite with En-suite facilities of a shower and a double basin unit. 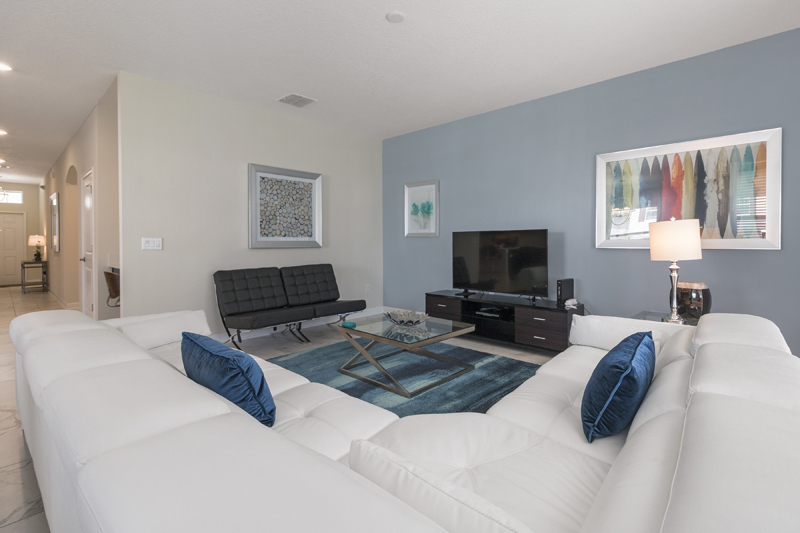 The room also includes a flat screen TV and the luxurious interior continues, as is the theme of this home.